It all begins with Baiting, Baiting, and more Baiting. We start baiting our stands in mid July at least a full 30 days before the season starts. This early baiting sets you up for success. We bait each and every day. We bait by boat because none of our baits are accessible by road or logging trail. This means more work for us but better hunts for you. You won’t have ATV’s, vehicles, or people coming into your area. We love archers and they do very well at Bear Lake. We start our fall season on August 15th with two weeks of Archery only hunts. 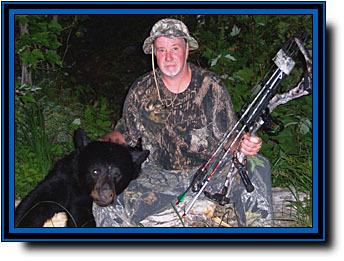 This allows the archer an opportunity to get closer to the bears before the gun season starts. We also maintain a small archery range with 3-D targets and elevated stands that help the archer on shot placement and accuracy. The average shooting distance for bow hunters is about 20 yards. The heights of our stands are generally 10 -14 feet high. Our gun hunts start the first full week of September. This lets the weather cool and gives us two more weeks to bait prior to your arrival. We maintain archery and gun hunting only areas so you will be hunting out of a fresh stand. We will only have four full weeks of Gun Season (weapon of choice). We have eliminated the less productive weeks and hunt only during the prime weeks of the season. Most any 30 caliber rifle is sufficient. The 30-06, 7mm, and the 44 magnum have brought great success. 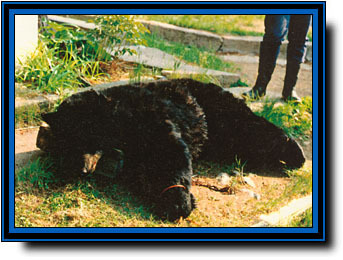 A heavy grain bullet is recommended for bear. Your shots will be 60 yards or less. Low power scopes and open sights work best. Both stands and ground blinds available. We self limit the number of hunters we have per week and the number of hunters we have for a season. We will take no more than 8 hunters per week and no more than 30 hunters per season. If we reach either of these points, we will close the week or the season to any more hunters. Your adventure begins by picking you up lakeside in Whitefish Falls on a Saturday. We will transport you and your party via speedboat out 15+ miles to our island. We will off-load your gear and let you get settled into your group’s cabin. We don’t mix groups. Once you get settled and draw your boat, we give an in-depth orientation on how the hunt works, bear movement patterns, knowledge of bears, and judging size. We also have an extensive question and answer session. We will pair you up with someone in your party. We take you to your stands and give you an in-depth area recon. We offer a full 7 Day Hunt; so you will be on baited stands Saturday through Friday of the following week. When you get a Bear, you will hail us on the radio. We have several guides out on the lake system that monitor the hunt by boat to avoid getting more human scent into the area. The guide will go directly to your stand and assist you with your Bear. Unlike a lot of lodges / outfitters we take a more hands-on approach. Our guide will help you track and retrieve the bear, field dress the bear, and transport it back to camp. We will then, skin the bear out, prepare the trophy, package the meat, and freeze it for your trip home. This is all included in the price of your hunt. 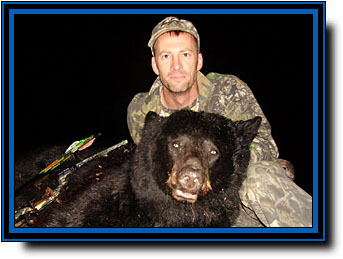 Fall bear hunts are in my opinion are better than spring hunts. 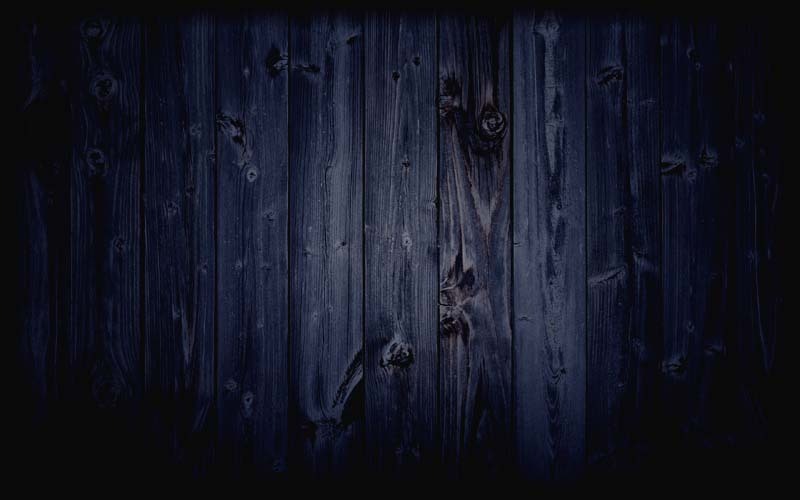 You don’t have to contend with black flies and mosquitoes. The weather is very pleasant and the bear hide is much better. The biggest difference is bear behavior. In the fall bears are less territorial and are apt to travel quite a bit. They are looking for food like berries or something sweet to add weight for the long winter. We use baits that appeal to their cravings, sweet baits with vanilla, honey, and caramel. It may sound a bit odd, but it is a proven winner. If you can smell it, imagine how far the scent carries! Our bear management area nestles up directly to Killarney Provincial Park. We view this park as our own private 40-mile square game preserve. 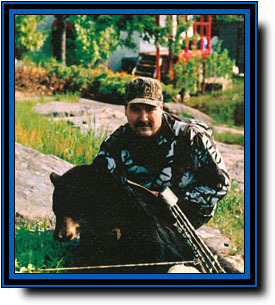 We have been successful at luring many bears directly out of the park. Our proximity to Killarney and our remote location make for a great combination. Our location is not accessible by road. We are surrounded by water and miles away from the nearest road. Bears grow big in this wild country and many reach 300 - 400 pounds. 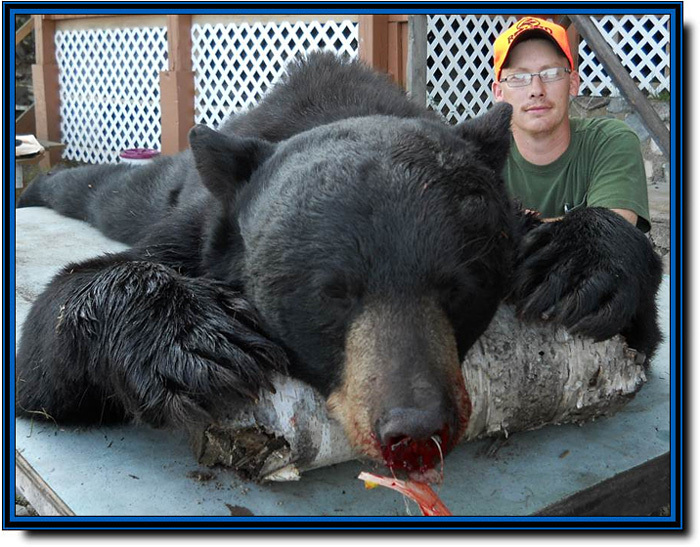 The avg weight of bears taken by Bear Lake Wilderness Camp hunters over the past 15 years has been 225 pounds. The largest has been 587 pounds. 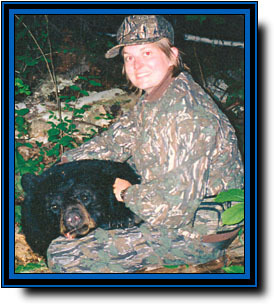 This past season (2005), we had 19 hunters and 13 took home bears. Good Shots are essential. Remember, because of the bush density and the bear being a sturdy, vigorous animal, first shots have to count, as second shots are usually difficult to get. This means you need to spend some time at the range. Your gun and/or bow should be sighted in. This will help insure your success and fewer injured bears. Scent is extremely important. The nose on the black bear is 40 times greater than the whitetail deer. So remember to take care of your scent. Use a "Hunters Specialty" type soap, let your clothes hang outside, and then pack your clothes in garbage bags with some evergreen needles. Boots with rubber soles are also highly recommended. They leave less scent. If you smoke, your odds of getting a bear are greatly reduced. Many hunters use the patch, nicotine gum, or a nicotine inhaler. 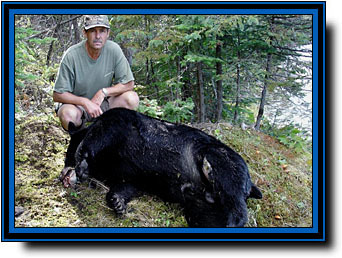 We offer you a Quality (7 Day) Hunt over baited stands with your friends in a remote area that holds one of the most concentrated Bear populations in North America today. We work hard at setting up and maintaining good baits. This is probably why we have one of the better success rates. 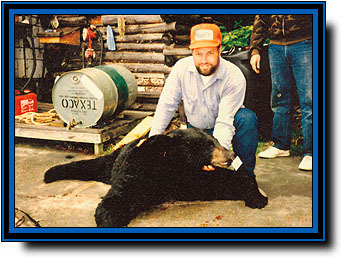 We monitor the bear harvest to ensure your maximum success by limiting the number of hunters both for the week and the season. So book early!